February 7, 2019 – About 90 colonies are said to have been founded by the archaic Miletus. If we believe the accounts of Pliny that is. Even though modern-day historians set a substantially lower estimate here, we definitely shouldn’t underestimate the significance and influence of the Ionic city of Miletus. Nonetheless, no catalog of the archaic coins of Miletus had been published so far. What a desideratum of numismatic research! Even more so if you bear in mind that lately a lot of numismatists have concentrated on the early phase of Western coinage. 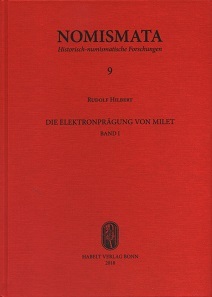 Rudolf Hilbert, Die Elektroprägung von Milet, 2 Bde. Nomismata 9. Habelt Verlag, Bonn 2018. 511 pp. Colored and grey-scale images. Hardcover. 20.6 x 28.6 cm. ISBN: 978-3-7749-4181-6. 89 euros. Rudolf Hilbert’s two volumes on the electrum coinage of Miletus constitute an opus that overwhelms you when you first hold in your hands regarding its sheer opulence. Yes, he has meticulously analyzed the available material – detailed images of more than 1,000 coins are depicted in their entirety, taking up the minimum necessary space, on 111 plates. He then applied all available numismatic methodology and noted his results. In addition, he offers statistical studies, which the average historian (who very likely only took math classes in high school because they had no other choice) is well-advised to just accept as they are. It’s very likely that different readers will make use of different parts of this book anyway. Coin dealers looking to compile a catalog as quickly as possible, are likely to concentrate on those pages that present all of the dies – like in Bodenstedt’s work on the electrum coinage of Phocaea and Mytilene, there is a die catalog and a catalog of all pieces used for this study. Anyone who wants to do hyper-meticulous work and is researching provenances, can’t avoid looking for “their” coin on the 111 plates depicted in the second volume. By the way, this work also has consequences for dating determinations: the author suggests a new chronology for the Milesian electrum coinage, namely 600-570 (phase 1), 569-547 (phase 2), and 546-530 (phase 3). Collectors are likely to read the four-page numismatic summary and the beautifully-written chapter on the archaic Miletus before they go on to search their own coin in the catalog. And researchers will probably fight their way through all of the 511 pages and will then ask themselves which of the methodological approaches they have a chance to adopt for their own work and which ones they can’t handle. This book has primarily been published for them – the researchers. Volume 9 of the Nomismata series, published by Johannes Nollé, Hans-Christoph von Mosch and Hertha Schwarz, can be purchased on the somewhat old-fashioned website of the Dr. Rudolf Habelt Verlag in Bonn for 89 euros. You can, of course, also just send an email. If you’re interested in what there is to see in Miletus nowadays, follow us on our digital journey to springtime Turkey.